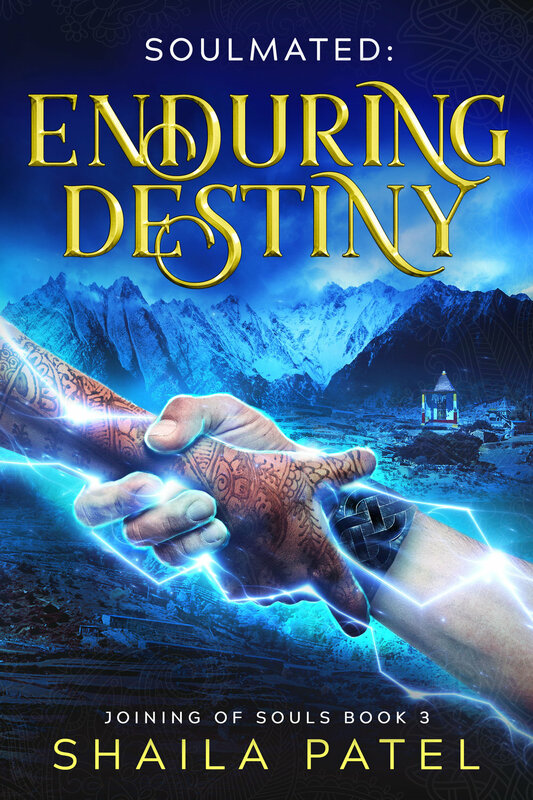 ENDURING DESTINY EXCLUSIVE EXCERPT FOR THE 2019 SPRING YASH! The force of being torn away from my nightmare left me trembling and gasping for air. Liam was phased too, and his presence in our dimension comforted me for a heartbeat before his anger registered. It chilled my bones. Alarmed, I tried to shake off the heavy blur of sleep but couldn't—until Liam's roar cut through it. I opened my eyes and took in the mess surrounding me. It was as if a wave of energy had blasted through the space. Things were strewn everywhere. Stumbling from the bed, I rushed after Liam, following his racing heartbeat down a flight of stairs. "Liam! No!" I yelled in my mind and out loud. Startled family peeked into the corridor, their mouths agape. Artfully arranged flowers now lay haphazardly by their vases in puddles of water, as if they'd been ejected from the opening. Liam hadn't been emotional enough to affect water since after Madison Blake's interview. At a huge crash down the hall, Robert and Joey hurtled out of their rooms and joined me. I rounded the last corner to the wing Ciarán used and heard the clanging of metal objects, fists on skin, and Liam's pained growls asking, "Why?" Tears filled my eyes. I couldn't let him kill his brother. With a burst of speed, I darted into his sitting room and found them rolling on the floor amidst all sorts of clutter, spilled bookshelves, and upended furniture. On the other side, Liam grasped his brother's throat, body slammed him against a credenza, and used him to sweep off the antiques on top, letting Ciarán crumple to the floor when he let go. "Liam, please don't kill him," I said in our minds, but he wasn't listening. "Why?" he shouted at Ciarán again, standing over him. Liam's face was red, the iridescent brown of his eyes pulsing. Pain contorted his features, the roots choking his soul…my soul. Liam reached for him again, but Ciarán lunged for an ornamental shield that had fallen and struck Liam on the side of the head, stunning him. "No!" By the time I climbed over the upturned furniture, Ciarán had grabbed the mace that must have hung with the shield and pulled back to swing it at Liam. In the second it took me to scream, the air sizzled and ionized around me. I threw my hands forward, directing a bolt of electricity straight at Ciarán's chest. It lifted him off the ground in a dazzling flash of blue and pinned him to the top of the wall. Please, God, don't let me kill him either. The energy receded just as quickly, and I dropped to my knees, pitching forward onto my palms and breaking the connection. George, Robert, Joey, and several of my gendarmes sped past me, jumping over whatever they had to. "Liam?" I asked in our minds, holding out as long as I could for a response before the blackness closed in. I came to in small degrees. My entire body felt like a first-degree burn. The cool bedsheets soothed my scalded skin, but I still didn't want to move. It was going to hurt. "Liam," I tried to say, but my vocal cords would only croak. "Shh, love." Fingers brushed back hair from my forehead. I felt the tingling and relaxed. Liam. With what seemed like a Herculean effort, I lifted my eyelids. His bruised face stared back at me, a smile lifting his lips. His sunken, red-rimmed eyes belied the gesture. Several stitches crisscrossed the hairline near his temple—the side where he'd been hit by the shield. Ciarán. Had I killed him? Please, no. Everyone would hate me. How could I face Moira and Patrick? Liam? I tried to ask, but my breath caught in my throat. Tears blurred my vision. Liam moved away to make room for the doctor and his nurse. My anxiety grew, but my voice wouldn't work. When I tried to reach for Liam, my heavy limbs wouldn't cooperate, and pain shot through me at the effort. I did the only thing I could to talk to him—I phased. Liam's panic hit me instantly, and as he transformed, all felt right with the world. "Liam, what happened? Please tell me I didn't kill your brother." That ends the excerpt of Book 3 in the Joining of Souls series. ENDURING DESTINY will be out May 30th, 2019! If you haven’t yet started the series, you can find more information about Book 1, SOULMATED, here. Happy Reading! Check out this awesome cover too!